Mt. Pleasant, PA (August 17, 2018) – Fabricating enclosures since 1985, ITSENCLOSURES is pleased to highlight another desktop enclosure from the IceStation line: the ID32-12. The NEMA 12 ID32 will protect electronics in various industrial settings by battling against dust, dirt, splashing fluids, lint, and fibers in the air. Constructed out of heavy-duty 14-gauge steel with 12-gauge doors, the computer/monitor enclosure measures 32” High by 28” Wide by 26” Deep. The enclosure’s standard features, include: a viewing window (17” High x 13.4” Wide) designed to accommodate up to a 21-inch monitor, an integrated lockable roll-out keyboard drawer (2.5” High by 21” Wide by 11.3” Deep), key locking latches on the front and rear doors, an adjustable/vented monitor shelf, and a rear, hinged split panel for cable and wire access. Thermal management options include a filtered fan system, which creates positive pressure that will eliminate harmful dust and dirt entry, a NEMA 12 heat exchanger, which contains two 4” 100 circulating fans, and a vortex cooling unit. For warmer environments, air conditioners are available to help create the perfect internal enclosure temperature to operate vital electronics. Heaters, in various wattage sizes, can also be installed the cabinet. The built-to-last ID32 can be customized with an extra shelf kit, sliding shelf brackets, a folding mouse pad, an adjustable bolt down or mobile pedestal, a 10-foot power cord, and a 6-outlet surge protector. “Throughout our 33 years, quality has been the key to our success. ITSENCLOSURES will not sell a product that will not perform at the highest standard,” added Mr. Spangler. 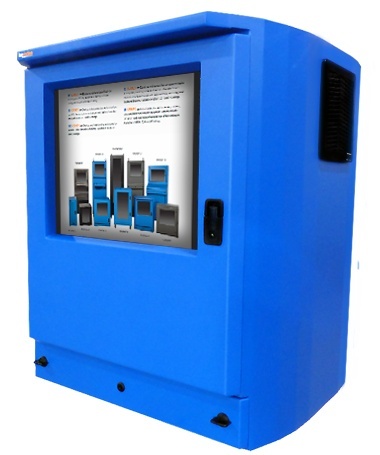 The enduring desktop enclosure is available in Blue, Gray, or any custom color found on the RAL color chart. “Our enclosure products, whether indoors or outdoors, will keep electronics safe from harm and will maximize the life of whatever is stored inside,” added JT Spangler. ITSENCLOSURES builds the most durable enclosures in the industry and always ships products completely assembled and ready to use upon delivery. Located southeast of Pittsburgh, Pennsylvania, ITSENCLOSURES has a large line of pc enclosures, printer enclosures, monitor enclosures, electrical enclosures, server enclosures, and LCD enclosures. All of ITSENCLOSURES’ products are Made in the USA and will protect a company’s investment and maximize electronics’ lifetime. For over three decades, ITSENCLOSURES has been helping companies protect technology investments and realize the maximum life cycle of equipment.